I am up early; the house is quiet. My editors don’t need me yet so I can sip my coffee without a file waiting in my queue. It’s a nice feeling, unpacking a brand new day at my leisure. I cruised by Julia Cameron’s blog for a bit. She’s bookmarked in my ARTS folder. It’s the place where I park important sites related to creativity. There’s lots in there about knitting but also about spirituality. My rationale goes something like this: if God is the Great Creator and we are made in His image, then we must be creative as well. Julia says that in all her years of teaching she has never met a totally not-creative person. Personally, my creativity is not limited to what I do with my hands. When I was an art director I learned how to think creatively, to find interesting solutions to common problems, to turn a thing on its head, to view life through a prism. Even at the time, I knew I was living in a gift, being paid to have the freedom to be outlandish. We’ve had a break in the weather. The sun sets sooner and comes up later. I quit knitting a tank top and started knitting a shrug. The neighborhood yard sale is this weekend: it’s a good time to take inventory and divest myself of stuff. I’m still married to the notion that I have to hang onto things because I might have a need for them someday. There’s also the pile of objects I keep because I just like the way they look. But occasionally I play a mental game in which I am packing to move into a new space. It sort of helps me determine just how much crap I really need to take with me. This is true of my inner residence as well. Stubborn myths and contracts remain attached to my heart even though I have chipped away at them over the years. But others have become mushy and friable and I am relieved to realize that I am no longer bound by the peculiar catechism of my childhood. 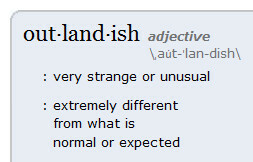 Being outlandish can be lonely. But I find it attracts people of like-minded pursuits, those who find joy in service, those who are tired of their rut, those who are pioneers. These are the ones I depend on to lend me an arm when I am limping. So down the path I go, probably the one less traveled. Surely treasure awaits.